A while ago I decided it was time for something to replace my Peavey Bandit amp. I was looking for a three-channel amp so I could have a separate channel for solo’s. Most three-channel amps however are pretty expensive so I started looking for a DIY-amp that suited my needs. I remembered a three-channel preamp kit that was sold at Musikding.de, and I noticed that they’d added another preamp kit called the Anvil. The Anvil was designed by Andreas Hoppe (or Andy) and is now being sold as a kit. 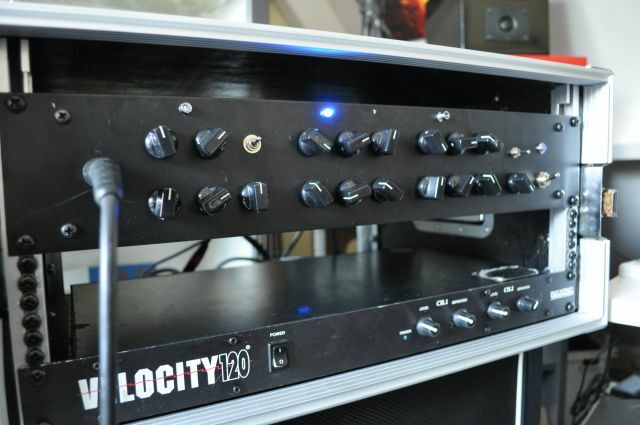 It’s a high-gain three-channel rack preamp with five JJ 12AX7 tubes, MIDI switching, effects loop, two inputs et cetera. More info is available at Andy’s website (in German). I decided to write this article to share my experiences and tips concerning the building of this kit for those of you who are interested in building this kit too. Apart from Andy’s site and a couple of forum threads here and there there is not a lot of info on the web regarding the Anvil so that’s why I wrote this post. I’ve also made some modifications to my preamp which I will describe here as well. First of all, this is nothing like building Tubescreamer clone #2352135 on a rainy sunday afternoon! I think I’ve spent about 50 hours on this thing so far and it’s still not completely finished (although I can use it, but I still need to paint the enclosure and apply the decals). Populating the PCB took me about ten hours although I have quite some experience in soldering et cetera. You’ll spent most of the time on the enclosure (drilling all the holes, mounting everything, measuring out all the knobs…) and that’s also the most boring part. You will also need some experience in soldering and high voltage safety, since this preamp uses voltages of over 300VDC. Therefore you need to isolate all the high voltage wires, connect all sides of the enclosure to protective earth (PE), carefully test the board for the first time. Luckily Andy has written a build manual in English (available from his website) which is a step-by-step guide on how to put it all together. All in all this is a big project but if you think you have the experience needed and want to build a good-sounding preamp with plenty of features you might consider ordering the kit! 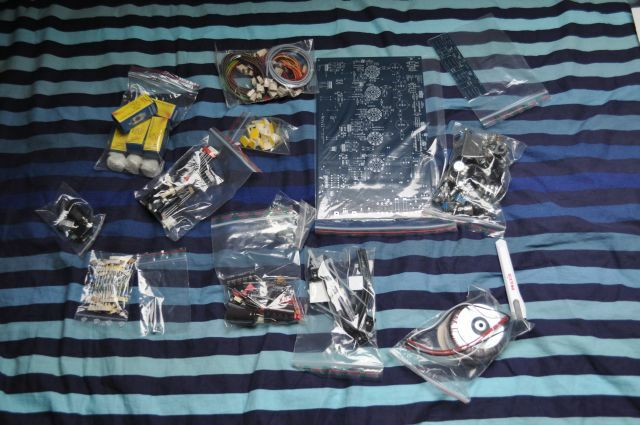 The kit costs 269 euro and contains everything you need: the enclosure, tubes, circuit board, connectors, resistors, transformer and so on. The only thing you need to buy extra are the knobs which you have to choose yourself. Fortunately, Musikding has a lot of knobs to choose from. Populating the board is pretty straightforward as all the component values are shown on the PCB’s silk screen. You might have a couple of components left at the end. Carefully check the PCB though for any overlooked components! When soldering the small output board (where the jacks are mounted on), replace R2003 with a jumper. This is also written in the build manual, but it is easily overlooked so I will notice it here again. If R2003 is not replaced with a jumper the output of the preamp will be very low because of the output relay not switching properly! As everything concerning the further assembly and testing of the kit is described in the build manual I will proceed with the modifications I did. Just follow the instructions and you can’t go wrong. In the original design all the channels have a bright switch. Personally I don’t like a bright switch for high gain channels so I decided to remove them from the rhythm and lead channels. The lead channel has an additional Presence control which controls the amount of top high (higher than the treble control) is passed to the output. This is a very useful feature, especially for rhythm/lead channels. It is really easy to add an extra Presence control to the rhythm channel, you can just copy it from the lead channel. If you take a look at the schematic you can see that all you need to do is connect a 1n capacitor in series with a 500k logarithmic pot across the rhythm channel’s volume pot! Another modification I did is the master volume. This lets you control the total output volume of the preamp which is useful when you want to quickly adjust the total volume of your rig. The master volume is a 25k linear pot which basically replaces R405. Be careful to use shielded wire here! I also recommend to replace all the jacks and midi connectors with better quality ones. The connectors supplied with the kit are not that great I have to say (although the mains connector is pretty solid). For the jacks I used Neutrik NYS216 jacks, they are sturdy, directly replaceable and inexpensive (about 0,50 euro a piece). For the midi connectors I used Procab VCD20 connectors. I’m still experimenting a bit with this preamp and perhaps I will add some tweaks to the tonestacks later on and post them here. Stay tuned, and good luck! This entry was posted in Electronics, Guitar stuff. Bookmark the permalink. a really nice article! Hope you will enjoy the preamp! Hey, can you send me a schematic overview? I’m curious about the MIDI switching part. Does it uses a microcontroller? You can download the schematic from Andy’s site: http://andyszeugs.de/projekte/anvil/anvil.html (click on ‘Filezammlung zum Amp’). Is there a chance that Andy could sell the MIDI controller chip?? nice article. I want to build the anvil preamp too. How it sound? Can you put some clips for listen it here? I’m super interested in the Anvil. Can you tell me exactly what is controllable via MIDI and if it would work well for extremely heavy metal sounds? Great writing on the anvil! I looked over the info Andy has on his website and he hints at a possible boost function. Know anymore about this?